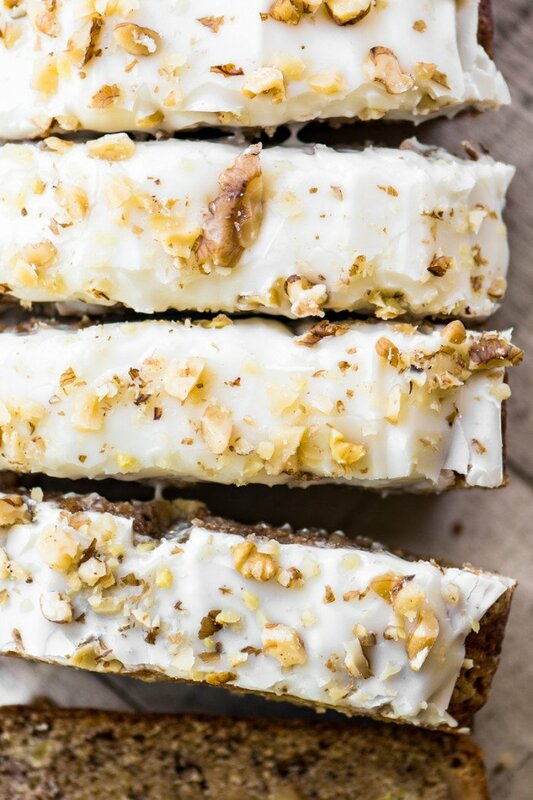 Better than Starbucks Banana Walnut Bread ~ this chunky quick bread is fabulously moist and tender, and topped with a thick layer of cream cheese frosting! set oven to 325F Spray and line a standard 9x5 loaf pan with parchment paper with long ends. This is so you can lift it out easily for slicing. Whisk the flour, salt, baking powder, baking soda, cinnamon, and sugar together in a large mixing bowl or a stand mixer. Beat in the egg, oil, and vanilla. Fold in the banana and nuts, and make sure everything is well combined. Turn into the pan and even out the batter. Bake for about an hour, until a toothpick inserted in the center comes out without wet batter clinging to it. (Moist crumbs are fine.) Let the bread cool for 15 minutes in the pan, then remove to a rack to cool completely before frosting. Blend the cream cheese, sugar, and vanilla with enough milk or cream to make a spreadable frosting. Spread over the top of the cooled bread, Sprinkle with chopped walnuts.